NOTE: On January 13th (2017) I have made some minor additions to this text following the indications of some commentators. Pilot has often used the anniversary pens as a mean to test the market and introduce new models and styles into their pen catalog. On these Chronicles we have already seen some examples. The Custom 65 (1983, 65th anniversary of Pilot) started the path for balance Custom such as 67, 74, etc. The flat top model of 1988, 70th anniversary, gave rise to the short lived Custom 72 and to a number of pens made for somehow special occasions. The urushi coated model of the 75th anniversary (1993) was the forerunner of the vest type (in Pilot jargon) Custom 845. 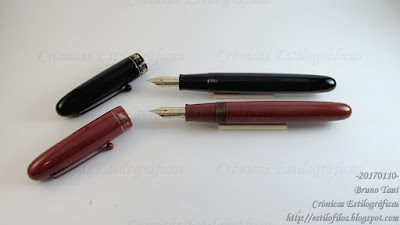 For its 80th anniversary, Pilot launched several pens. On the most luxurious side there was a trio of flat tops lavishly decorated with maki-e. That was the “Miyabi” set, with a price of JPY 800,000 each pen. More affordable –a lot more— was the set of pens of this Chronicle. These pens are a balance model of intermediate size between the Custom series (nib sizes 3, 5, 10, 15) and the Emperor size (nib size 50) jumbo pen. This anniversary pen introduced a new nib that was later labeled as 20. It is about the same size as the 15, but with a different geometry. Its filling system is by cartridges and converters. 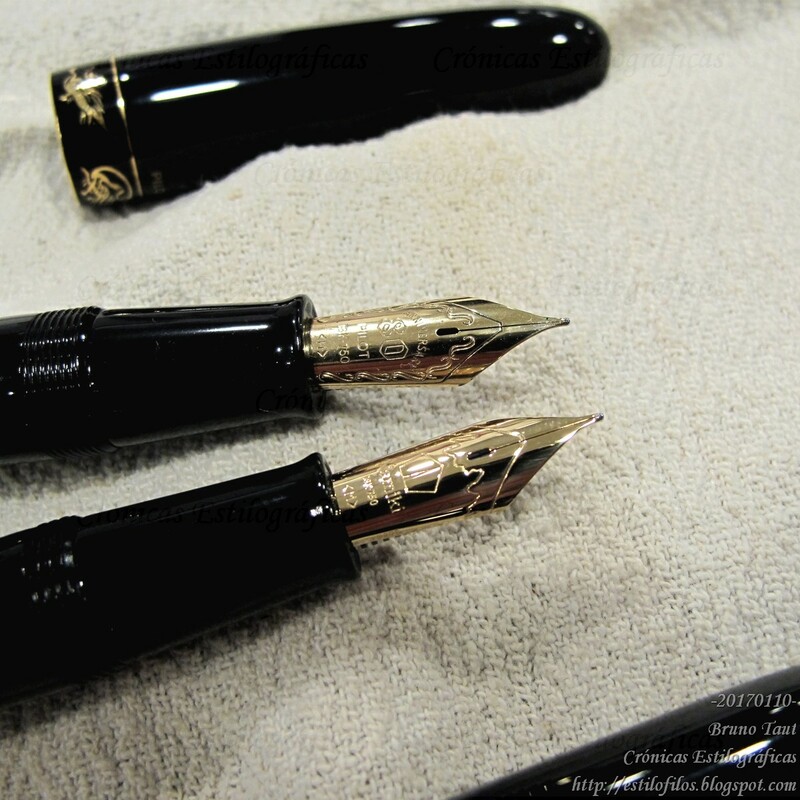 The nibs are, in actual terms, of size 20 (Pilot/Namiki system), made of 18 K gold. On the top left corner, the decorated cap band of the black pen. Inside, a converter (on the pic) or a cartridge. On this case, the converter CON-70 is painted in black. Despite the rumor, it is not lacquered. On the pen body, the collective signature of the group of maki-e artisans of Pilot or kokkokai. Right under it, not visible on the pic, the unit number of this pen is engraved. This is, after all, a limited edition. Externally, these 80th anniversary pens are coated with urushi and a decorative band on the cap made with the technique of “togidashi maki-e“. This band depicts four mythological animals gods (Shijin, 四神) of the Chinese tradition, also common in Japan. Two colors were available –red (shu urushi, 朱) and black (ro-iro urushi, 呂色). 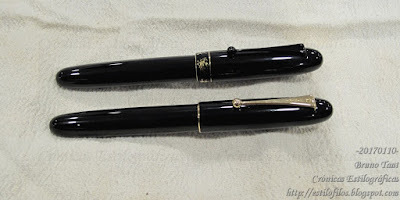 1918 numbered units of both combined, black pens numbered first. They are signed collectively by the “kokkokai” (國光會), the guild of maki-e craftsmen of Pilot instead of by any of them in particular. 1918, let us remember, is the year when Pilot started its business. These two anniversary pens were the prototypes of the Yukari Royale series branded as Namiki. The first Yukari Royale would show up in the market in February of 2003, while the urushi lacquered versions were only available in Sept of 2007. The Yukari Royale, with a size 20 nib, is the other quintessential Namiki pen together with the size 50 jumbo. The other nib sizes used by Namiki, 5 and 10, are also implemented on Pilot models. 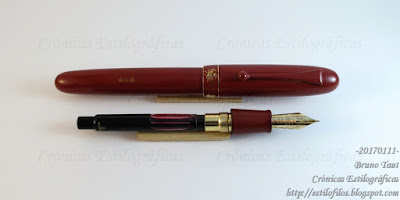 The basic Yukari Royale pens are decorated in plain black and red urushi, and in fact Pilot/Namiki does not call them “Yukari Royale” but “Urushi Collection No. 20”. 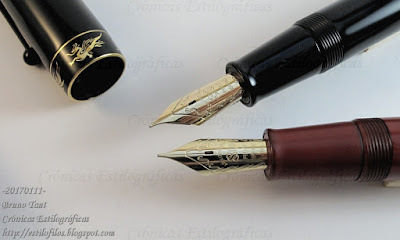 The differences between these are the old Pilot Shijin pens are purely cosmetic: the Namiki carry no decorative band on the cap, the nib simply says Namiki, and the clip is gold plated instead of lacquered. On top, the old Shijin pen from 1998. On bottom, the currently produced Namiki Urushi No. 20. In essence, these two pens are identical--same brass-made pen with urushi decoration. The nibs of the pens of the previous picture are engraved differently. After all, one is a Pilot; the other, a Namiki. In both cases, the feeds are made of plastic (like in any other Pilot/Namiki pen currently on production). Ink deposit: 0.9 ml (cartridge), 1.0 ml (CON-70 converter). The original price of this limited edition was JPY 80,000 (plus tax, 5% at the time). 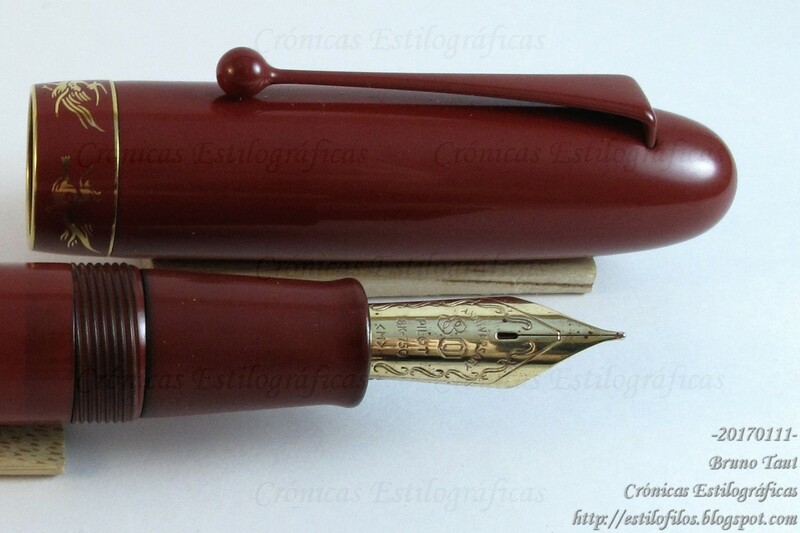 The current price of the “Namiki Urushi Collection No. 20” is JPY 128,000 (plus 8% of taxes). The red Shijin pen was on display at the Pilot Museum in Tokyo, the defunct and sadly missed Pen Station. 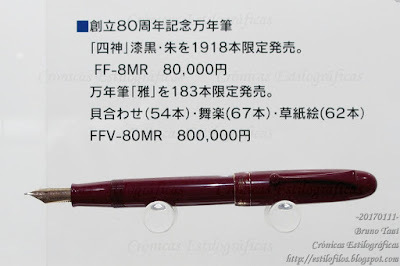 The reference of the Shijin pen is the FF-8MR (plus -BM for the black pen, or -RM for the red), and its price was JPY 80,000. The second reference corresponds to the Miyabi pens, whose price was JPY 800,000. Thanks, Anonymous Nikos, for your insight. Both (or all three) pens are made of brass. I have included a small note on this in the text. Family Portrait (VIII). Myu-25 at al.